But the larger implication is that the US as a political force is not the public relations superpower it once was. Moreover, the Obama administration, like the Bush administration before it, has demonstrated time and again that phrases such as “cooperation” and “European partnership” are merely hollow expressions of propaganda, rather than genuine descriptions of mutually respectful relations. Indeed, what is clear is that the US establishment, regardless of which wing of the single corporate party is in power, is less interested in relationship-building than it is in dictatorship-building; accept US diktats…or else. US Threatens Others – What Else Is New? I think it’s fair to say that maybe some point down the line there might be a UK-US trade agreement, but it’s not going to happen any time soon because our focus is in negotiating with a big bloc, the European Union, to get a trade agreement done…The UK is going to be in the back of the queue. 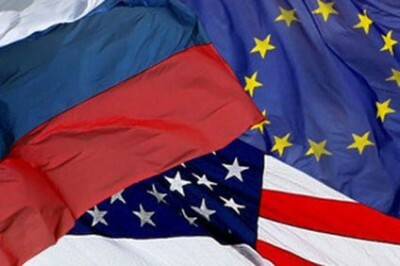 hich Washington is able to get its allies in Europe to fall in line with US policy. This fact is perhaps best illustrated by the sanctions imposed by the European Union against Russia in the wake of the annexation of Crimea and Russia’s support for the rebels of Donetsk and Lugansk. It is no secret that the sanctions were imposed, and subsequently extended, against Russia thanks in large part to arm-twisting by the Obama administration which sought to use the sanctions as an economic and psychological weapon against Russia in hopes of punishing Russian President Putin and his circle of advisers, and of course the Russian people more generally. My understanding is that the plan is for the President, when he goes to Europe, is to have a discussion with fellow European leaders about the need to extend the sanctions regime that’s currently in place… there are a number of steps involved in that process, and this will be part of the conversation — frankly, a wide-ranging discussion that the President will have with his G7 counterparts…the longer that the sanctions are in place, the more of an economic bite they take out of the Russian economy and the more pressure is applied to President Putin and the more President Putin and the country that he leads becomes isolated. The obvious implication of Earnest’s wordy statement is that Obama was going to Europe to convince, coax, and cajole key European leaders of the need to sabotage their own economic cooperation with Russia as a means of punishing the country or, to put in more realist terms, to please Washington by displeasing Moscow. And, despite talking points from the US and Europe to the contrary, the EU sanctions on Russia have indeed hurt the European economy and clearly go against its own interests. According to an independent 2015 studycarried out by the Austrian Institute of Economic Research (WIFO), and commissioned by newspapers in the Leading European Newspaper Alliance – with involvement from Tribune de Genève (Switzerland), Le Figaro (France), El Pais (Spain), and Die Welt (Germany) – the sanctions against Russia would cost Europe up to €100 billion in economic development and jeopardize up to 2.5 million jobs. In fact, the sanctions have been so divisive in Europe that earlier this year EU foreign ministers were in sharp disagreement over the need for extending the sanctions further. As has been the case since the sanctions were first imposed, the states closest in relations with the US were the most hawkish on the need for continued sanctions, while other influential countries were more inclined to drop the sanctions and move forward. Of particular note has been the position of Germany which has at once supported sanctions and the reasoning behind them, and simultaneously inked contracts with Russia for the construction of a new Nord Stream pipeline to bring Russian energy to Germany’s all important industrial sector. Naturally, a number of European leaders have mused openly about why their economies should suffer while Europe’s economic engine in Germany manages to continue humming along, reaping the benefits of economic cooperation with Russia. The answer is not hard to figure: Washington demands it. But as the realization of Obama’s inability to impact the Brexit vote sets in, many might be left wondering why they’re still listening to the US at all. It must be said that millions of Britons were of course in favor of remaining in the EU, though it is an open question whether the remonstrations from the US President had any impact on their decision. Ultimately, the Brexit vote was more about British politics, nativism, the political co-location of the far right and far left, discontent among the working class, and a number of other factors. But for those of us who yearn to see a more equitable distribution of power globally, we cannot help but notice that despite all the threats from the White House, Wall Street, and the media organs of institutional power, Britain is leaving the EU. Maybe it’s time Washington took seriously the notion that its allies are equal partners, not junior ones.